Calgary, Alta. 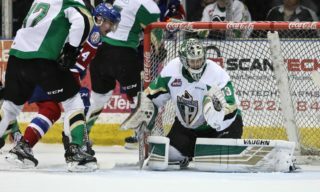 – The Western Hockey League announced today that Prince Albert Raiders forward Brett Leason has been named the WHL On the Run Player of the Week for the week ending October 14, 2018. Leason recorded eight points (5G-3A) and a plus-eight rating as the Raiders won all three of their games. Beginning their week in Leason’s home town of Calgary, Alta., the Raiders rolled to a 4-0 victory last Monday against the Calgary Hitmen. Leason tallied the third and fourth goals of the game while picking up the lone assist on the Raiders’ second goal of the contest. He was recognized for his efforts Monday as the first star of the game and the third star of the night in the WHL. 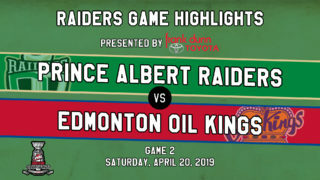 Saturday, Leason factored into both goals as the Raiders defeated the visiting Red Deer Rebels. Leason drew a primary assist on the Raiders’ first goal, then pulled off a brilliant play for the game-winning goal, bouncing the puck off the backboards and beating two defenders to the puck. His efforts got him first star of the game honours at the Art Hauser Centre. With the Raiders heading to Saskatoon Sunday for a date with the Blades, Leason tallied a pair of goals and an assist in a 6-2 victory for the Raiders. 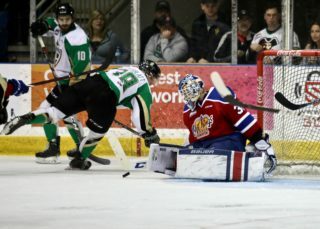 Leason scored Prince Albert’s third goal of the contest, then added a short-handed empty-net goal to secure the victory. 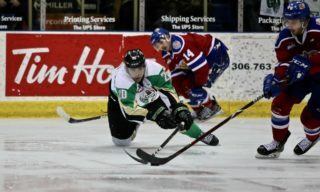 He also picked up a primary assist on the Raiders’ fifth goal of the game and earned third star honours in the contest. Overall, Leason recorded seven points (4G-3A) at even strength with a single goal on special teams. He also notched a pair of game-winning goals throughout the week. The seven-day snapshot of Leason’s season is part of what has been an impressive first 11 games for the 19-year-old. In 11 games, Leason has recorded 22 points (9G-13A) to sit in a tie for first in league scoring. He has 14 points (7G-7A) at even strength while the other eight have come via special teams. Leason, who is eligible for the 2019 NHL Draft, was originally selected by the Tri-City Americans in the third round, 50th overall, of the 2014 WHL Bantam Draft. Since then, the 6-foot-4, 199-pound forward has played in 146 WHL regular season games split between the Americans and Raiders, recording 73 points (33G-40A), including four power-play goals, four short-handed goals, and five game-winning goals. He’s also added three assists in 11 WHL playoff games. 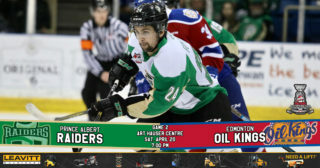 The Raiders are back in action Tuesday, October 16 (7:00 p.m. MT) when the Hitmen pay a visit to the Art Hauser Centre.